Our detached holiday house at the Dutch. Coast, between Alkmaar and Den Helder, in St. Maarten, in the bungalow park De Wielen, is characterized by its family atmosphere and luxurious comfort. The holiday home stands on a plot of almost 400 square meters close to Amsterdam and has a living / dining area with open fireplace, cable TV, blue-ray player, digital satellite system, BOSE streaming box and ground floor a luxury bathroom with rain shower and double sink, a fitted kitchen with Miele appliances and large fridge, hallway, bathroom with walk-in shower and storage room with Miele washer and dryer and iron with ironing board. The upper floor has 3 bedrooms. Team 7 furniture, Miele appliances, landline telephone, cable Internet with wireless, a beach cabin, WEBER Grill, a 42 'LED TV from Philips (with Ambilight and 3D) with Bundesliga and Champions League in HD and 3D prove the luxurious standard. Given recently a Samsung UHD TV with HD programming has come, hanging on the wall in one of the bedrooms. In addition a Samsung tablet, with which one can serve also the in-house Spotify account, the BOSE box, the in-house movie server and the television. Route: From Dortmund to our house it takes about 3 hours. Here the path over Arnhem, Utrecht, Amsterdam and Alkmaar is recommended: A 2 to Oberhausen, then A3 towards Arnheim, in the Netherlands, the A3 is the A12 direction Utrecht, in Utrecht change to the A2 towards Amsterdam, shortly before Amsterdam change A9 towards Schiphol, Haarlem, Amstelveen. Following the A9 until Alkmaar, then the N9 until St. Maartensvlotbrug, then direction St. Maarten. The Region: The location on the North Western coastal region of the province of Noord-Holland is distinguished by its beautiful and colorful flower fields. The broad and fine sandy beaches can compete with any beach in Europe - but the generosity of the beaches is surely unique. Beautiful coastal towns like Egmond, Schoorl, Callantsoog, Julianadorp or the artist town Bergen offer with its promenades a nice change for sunbathing. The on the coast by flowing Gulf Stream creates a very mild climate, even in winter. The central location to the West Frisian Islands (z. B. Texel, Terschelling, Ameland) or the IJsselmeer with its magnificent cities Hoorn and Enkhuizen and the nearby cosmopolitan city of Amsterdam, provide maximum variety. The statistics, the North Holland coast region than with the most sunshine hours. The holiday park De Wielen is located from the beach crowds in the small and quiet village St. Maarten (Sint Maarten), but still close enough to the beach to easily reach it by bike. Even smaller children achieve this without great effort. The cosmopolitan city of Amsterdam is about 55 km away. It makes sense to go from the neighboring town Schagen with the air-conditioned train direct to Amsterdam. Now the luxury bathroom is installed and available for our guests. Rain shower (Grohe), double sink with plenty of cabinets and storage space (Burgbad) or floor - this bathroom leaves nothing to be desired. Same value applies to the guest bathroom upstairs, which even has a built-in radio. In 2009, a new and electronic boiler was installed, which can be controlled by a central unit in the kitchen area. An adjustable night setback increased sleeping comfort. Linen can alternatively be booked added. A linen and towel package costs 17,50 euros per person and stay. The Miele washing machine has 1600 rev / min and a variety of wash programs. The Miele dryer works as a condenser with a variety of drying programs. Our house has a 200 Mbps down and 20 Mbps upload connection from the Dutch cable operator ZIGGO. Towels can alternatively be booked added. A linen and towel package costs 10 euros per person per stay. In 2011, we acquired two new leather couches of NATUZZI. Again, the furniture is made of untreated alder wood by TEAM 7. Only the floor lamp is made of untreated beech wood. Our Miele dishwasher features include a hygiene function, with which you can sterilize kitchen appliances or children's bottles. In our kitchen is a 112 cm refrigerator installed, which provides enough space for a 7-person-household. It is a four-field-ceramic hob with sensor buttons. Here is a Miele oven with a large number of baking and roasting programs available. In addition, he has to clean pyrolysis function. Instead of a microwave oven is a steam oven provided with the same mode of action is achieved. Food is heated friendly and healthier. In the house there is a long slot toaster - four slices of toast can be crispy. The most essential spices are available. However, these are the only storage of unopened food. We use dishes for the brand 'Friesland' and cutlery by 'Zwilling'. The dining room was also equipped with untreated alder furniture from TEAM 7. We have satellite and cable TV. Cable TV is designed as an alternative if the satellite fails. We have also a variety of German and English programs. It is a Sony Micro System, which will certainly be renewed next year. However, it is amazing what a good tone creates them. We have a Blue-Ray Player with 3D from Philips, which also take a stick and from there you can transfer the content to the TV. There are both children's and adult books in the house (but only in German). There are several good board games in the house. There are twenty Blue Ray and three 3D movies in the house. The garden is about 400 square meters. We attach great importance to the maintenance of the property. We mowed the lawn every week and there are constantly introduced new plants. The width of the doors can unfortunately not wheelchair accessible. Because of an allergy of our son pets are unfortunately (!) not allowed. The bedroom area is equipped with an all-massive and untreated alder furniture (Team7). In addition, a Tretford carpet (natural hair) has been designed. Thus, even with allergies will feel in this house very well. The digital satellite system and the 42 'LED TV from Philips with Ambilight and 3D lets you enjoy the Bundesliga (also on Fridays), the Champions League and the feature films in HD and 3D. The outer way lighting the house will be in the evening to an eye-catcher. The house also hosts the Festnetztelefon-, fax and internet - only the cost of telephone calls must be paid. Also a furnished with couches beach cabin at the wonderful, large and sandy beach is now free to home. The conclusion of the 'big' renovations now reflected in our luxury bathrooms. Look at the pictures that say more than words ..
We enjoyed a very comfortable and relaxing week in this lovely holiday home. The property is modern, very well furnished and equipped, it is clean, bright and quiet with good space outside for soaking up the sun. The owners were very easy to rent from, directions all in English so despite not knowing the area at all we were able to drive straight to the house with no problems. The area is well worth a visit, Amsterdam is in easy reach by car, the coast can reached by using the brand new bicycles you can rent from the owners. The beaches are very sandy with loads of room. A couple of good restaurants can be found within cycling distance. During our stay in April the bulb fields were a delight and the weather was kind to us. We will most certainly return and would recommend the property and the area to others. No real down sides at all - it is a bit of a myth that all Dutch people speak English - they don't, often the second language was German, as we are English and our second language is French we did end up pointing a lot and guessing on menus --- but that was all part of the fun. Many thanks for a great week and see you again soon. StanUSA and Baltics and Sint Maarten,NL. I first stayed in this Sint Maarten home for 20 days in 2008. Having recently sold my flat(my residence) in the Baltics, I decided to come back to this Sint Maarten home in early January of this year= 2011. I am now staying for 3 months because this home is very peaceful. (Also, I will stay 4 more months next Winter). This home has had a lot of modern appliances and work done to it recently- new heating system, stove, washer/dryer,total renovation of the kitchen . This home is high tech(modern) and beautiful. There is Wi Fi, 2 satellites(with all BBC stations and of course local stations and German stations) flat screen TV, stereo and other electronics.There are board games for the family/children and a bed for babies or small children. . There are several bicycles ,beautiful yard furniture etc. I am 63 years old and I have traveled since 1965 and this is the best place I have ever lived. I have enjoyed my stay here very much! This tenant is a polite man who has treated our house very carefully. He also wanted to perform minor repairs what we didn't allowed, because in his age he should enjoy our house. Each of his e-mails was marked by cordiality and helpfulness. We have taken that open-minded person in our hearts and we hope that his wish of a peaceful world may ever meet in his presence. Sauber + ausgestattet mit allem was man benötigt. Kurz, knapp, prägnant...so mögen wir es auch - insbesondere die 5 Sterne freuen uns ganz besonders. Vielen Dank dafür! In diesem allein stehenden Ferienhaus inmitten der Polder bei Sint Maarten fehlt es an nichts. Neben drei Schlafzimmern und einem WC in der ersten Etage, befinden sich der Wohnraum, Küche und Badezimmer im Erdgeschoss umgeben von einem kleinen Garten mit Terrasse. Die Einrichtung und Ausstattung sind Premium-Klasse und erfüllen die höchsten Ansprüche. Ein offener Kamin krönt die gemütlichen Abende, vor allem im Winter. Das Haus ist sehr zu empfehlen. "Premium-Klasse", "erfüllt höchste Ansprüche" und "ist sehr zu empfehlen"....wenn man das liest, sitzt man mit einem breiten Grinsen vor dem Computer und mahnt sich zu Ruhe nun mit Worten nicht auszuflippen. Es ist einfach schön, das zu lesen. Wir werden uns weiterhin richtig Mühe geben, diesen Standard beizubehalten, um noch mehr von diesen tollen Bewertungen zu bekommen. Sehr gute Unterkunft mit einer exklusiven Einrichtung. Entfernung zum Strand ist jedoch nur für sportliche Urlauber geeignet. Es ist nicht ganz einfach, auf derartig knappe Bewertungen eine entsprechende Antwort zu finden. Die Überschrift gefällt uns natürlich, da sie zeigt, dass man mit unserem Haus doch zufrieden war. Der eine Satz als eigentlich Bewertung lässt die Vermutung zu, dass es diesem Gast ein wenig zu weit zum Strand war. Wir haben in unserem Inserat deutlich gemacht, dass die Entfernung zum Strand 5,5 km beträgt. Ferner erhält jeder Gast von uns über 30(!) Beschreibungen, damit er sich sofort am Urlaubsort zurecht findet, wenn man sich denn vorher damit befasst. In einer dieser Beschreibungen wird auch auf den Parkplatz am Strand hingewiesen. Hierbei ist vermerkt, dass der reizvolle Weg durch die Dünen bis zum Strand 900 m beträgt (ist die exakte Entfernung!). Ferner setzen wir auch voraus, dass sich jeder Urlauber eigenverantwortlich den Urlaubsort vorher ansieht. Auf Google Maps kann man alle diese Dinge nachsehen. Daher ist es für uns nicht fair, wenn hinterher ironisch über einen Umstand "gemeckert" wird, der auf eigenen Wunsch der ganzen Welt bekannt ist. Wir können über diese Gäste nur Gutes berichten, da die Kommunikation äußerst freundlich und höflich war. Zudem wurde das Haus in einem hervorragenden Zustand verlassen. Sehr saubere Unterkunft. Alles vorhanden wie in der Beschreibung vorgestellt. Auch die Fahrräder waren in einem top-Zustand! Der Verwalter Vorort stand für alle Fragen zur Verfügung! Schön, dass auch unser Verwalter hier genannt wird. Er ist die gute Seele des Hauses und sorgt dafür, dass unsere Gäste einen guten "ersten Eindruck" von der Anreise und vom Haus bekommen. Ich werde dieses Lob besonders gerne an ihn, seine Frau und seine Schwiegereltern weiterreichen, die sich allesamt liebevoll um unser Haus kümmern. 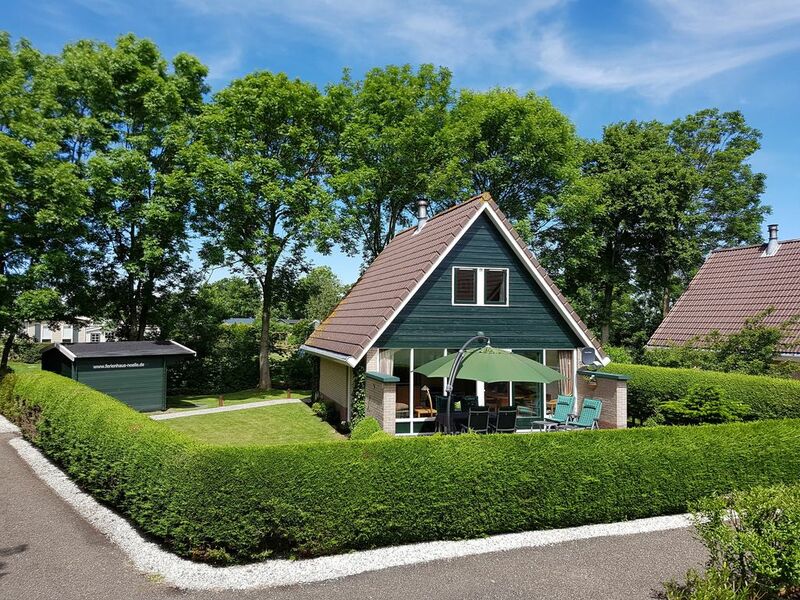 In the countryside of Amsterdam, near the coast and the sandy and spacious beach of North Holland, not far from attractive sights, our luxurious holiday home in the bungalow park De Wielen in St. Maarten. Whether swimming pool, 42 'LED TV from Philips with Ambilight and 3D, 2nd UHD TV in a bedroom and with broadcast of the Bundesliga or Champions League in HD and 3D, a BOSE streaming box, a free beach cabin, landline telephone and fax connection, Internet with Wi-Fi, luxury bathroom with rain shower, high-quality Team 7 furniture or high-quality Gazelle bicycles with Chariot child trailer - This house leaves nothing to be desired and is hard to beat in terms of comfort. The central location of this house lets besides the attractions of the metropolis Amsterdam nor the cheese market in Alkmaar, the IJsselmeer, the coastal town of Den Helder, the West Frisian Islands, the artist town Bergen, the port towns Den Oever, Medemblik, Horn or the flower parade in Bollenstreek in central location appear. Given many attractions for children come with some amusement parks in the surrounding area as well as an aquarium in Den Helder. Golf: Brand new 18-hole course, par 72, Groenvelderweg 12, 1746 EE Dirkshorn. Tel. :0031-224-274050, Distance: 2 km. Golf course Sluispolder, address: Sluispolderweg 7, 1817 BM Alkmaar, phone: 0031-72-5111555, holes: 18, par 72, Distance: 17 km. 1,50 € pro Person und Übernachtung als Kurtaxe. 8 hochwertige Fahrräder (Gazelle) und ein Kinderanhänger (Chariot) können optional für 85 Euro angemietet werden. Wir empfehlen den Abschluss einer Reiserücktrittversicherung. Der Preis gilt für alle Räder+Trailer im gesamten Mietzeitraum. Von Anfang April bis Ende Oktober kann unser Haus immer nur von Samstag bis Samstag angemietet werden - auch wenn das System von FeWo-direkt etwas anderes zulässt. Sie können nur für die Zeiträume buchen, für die Wochenpreise in der Übersicht hinterlegt sind - und nur maximal eineinhalb Jahre im Voraus. Sonntag ist grundsätzlich kein Anreisetag. 8 high-quality bikes from Gazelle and a child trailer from Chariot can be rented for a total price of 85 euros. As of begin April until end of October it is only possible to rent our home from Saturday to Saturday. You can only booked for these periods where you can see week-prices in this advertise - and only one and a half year forward. You don't can arrive on Sunday!